Our Retro Halloween page features a collection of various Retro Halloween crafts, items and collectibles designed with a Retro Halloween vintage style. If you have any Retro Halloween crasfts, items or collectibles that you would like to sell and promote on our Retro Halloween page, please contact us. Black Cat Candy Box Halloween Figurine - Folk Art designed Figurine designed by Johanna Parker that doubles as a candy box. Halloween Memories Mug - Ceramic mug with a retro 1930s style design with Halloween images wrapped around the mug. 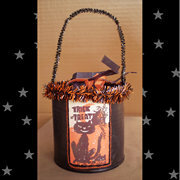 Retro Halloween Candy Bowl - Retro style Halloween Candy Bowl made by Bethany Lowe Designs. Retro Style Merry Halloween Greeting Card - Smiling black cat sitting inside a pumpkin wishing you a Merry Halloween. Vintage Retro Halloween Towel Set - A set of 4 Halloween towels made with 100% cotton designed in a retro modern vintage style. Vintage Style Halloween Owls Decoration - Vintage style cut out decoration displaying owls and a bat.